Cliff "Cliffski" Harris has released a new development video for the upcoming Gratuitous Space Battles 2, showing off new beam weapons, improved fighter behavior, and more realistic damage effects. It's possible to enjoy this video simply for the majestic destruction it brings to the table, and in that regard the new Gratuitous Space Battles clearly isn't going to deviate far from its predecessor. But it also looks to be considerably improved in a number of ways, such as with the addition of nebula clouds, squadrons of fighters that fly in formation, and capital ship damage that appears to be internal, rather than simply painted on. 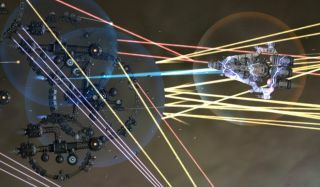 There will also be more types of "support beams," enabling more complex interactions between capital and support ships. It was thought back in the summer that Gratuitous Space Battles 2 might come out before the end of the year. With December looming and no release date announced, however, 2015 is looking increasingly likely.